Hand and finger injuries have been considered a significant challenge in the oil and gas industry. This article reviews the mitigation measures in hand and finger injury prevention plans that have been used by oil and gas companies. Jobs in the oil and gas industry are some of the most hazardous in the world. In addition to fire and explosion risks, there are some certain risks such as hand and finger injury that the workers are facing on a regular basis. Hand and finger injury is one of the permanent appearances on oil and gas companies’ incident databases and is one of the leading injuries in the industry recordable incidents cases every year. Historically, hand and finger injuries make up nearly 50% of incidents in the oil and gas industry and sometimes this figure reaches up to 80% of all recordable incidents. According to the International Association of Drilling Contractors' 2014 statistics, hand and finger injuries were attributed to about 43% of all recordable incidents on drilling rigs. This figure is an increase on previous years, when it reached 41% and 40% in 2013 and 2012, respectively. As a results of such statistics, companies are concentrating more and more on hand and finger injury prevention strategies. Threats to the hands include: being caught between and struck by objects, chemicals, vibration, heat, cuts, bruises, breaks, burns, punctures, amputations, cold, and infectious or biological agents. Hands and fingers have more nerve endings per square centimetre than any part of human body. In addition to that, hands and fingers have more pain receptors than any part of our body. This help us to quickly remove our fingers from a danger zone if we could and because of these receptors, through experience finger injuries can be more painful than similar injuries to other parts of the body. There is no need to accentuate the fact that proper risk assessment and communicating the results with employees plays an important role in minimising hand and finger injuries. Identification of related hazards such as pinch points, cut, puncture, chemical exposure and defining suitable control measures will be a starting point in any hand and finger injury prevention plan. The priority should be given to minimising employees’ exposure to unnecessary risks, with elimination of requirements of employee involvement in hands-on activities if reasonably practicable, or implementation of engineering controls. Use of protective gloves should be considered as a last mitigation option in the hierarchy of controls. It is imperative to mention that most of the time protective gloves lessen the severity of injury and if they fail it could expose the employee to the inherent danger. Due to the large number of hand and finger injuries each year, most oil and gas companies put a hand and finger injury campaign in their annual HSE plans and define it as one of their KPIs. Companies allocate required resources including budget, people and time to implement these campaigns. Establishment of hand and finger injury working groups, conducting awareness sessions, organising workshops, distributing awareness posters and introducing better protective gloves are typical activities included in such campaigns. Increasing workers awareness in relation to hand and finger injuries and concentrating on risk behaviours leading to hand and finger injuries is critical and is widely used by companies. Simulated exercises such as taping up a volunteer’s dominant hand and asking him/her to perform some simple jobs could be an effective learning practice, as it will help employees understand why they should take care of their hands and fingers all times. Organising speeches by those who were involved in hand and finger injuries and explaining how such injuries affected their life has also proved beneficial as it increases workers awareness and gives them the opportunity to learn from experience. As a good attitude towards health and safety is critical, behavioural based training and involvement in some activities such as a hazard hunting exercise is fundamental to achieve the required results. Training, communication, on the job coaching, and employee involvement are key components to keeping hand safety awareness a top priority. Certain type of injuries have been reduced by using advanced technology, such as remote control pipe handling systems in oil and gas drilling rigs. In fact, removing personnel from machinery has assisted companies in improving their safety performance. For instance, the introduction of iron derrickman on drilling rigs eliminated the requirement to have a derrickman on top of the derrick and exposure to various risks including pipe handling, where all operations could be performed and controlled by the driller remotely. Other typical examples of advanced technology are a remote top drive system that achieve ‘hands-off’ casing running operation, which has an obvious safety advantage. Some oil and gas companies in regions such as Norwegian waters are obliged to comply with certain regulatory requirements and use the unmanned and remotely operated equipment. Introducing advanced equipment, however, created other hazards to personnel and in some cases significant incidents occurred. These include collisions and other interactions between remotely controlled equipment and personnel, between equipment and structures, between different drill floor equipment and within the equipment itself. Handling and positioning of heavy equipment often results in trapped or crushed fingers and hands. 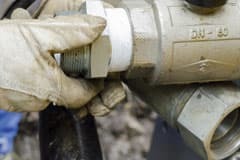 The majority of oil and gas companies and contractors have developed ‘hands free’ policies and initiated comprehensive campaigns in order to reduce the number of hand and finger injuries. This was acheived by enforcing the use of tagline and push pole for loads, as well as installing CCTV on crane booms on rigs and platforms during lifting operations. There is no doubt that the gloves play a significant role in protecting workers' hands and fingers. According to the Occupational Safety and Health Administration around 30% of hand injuries occurred because hand protection was inadequate, damaged or misapplied. The old cotton glove days are over now and high-performance hand protection is required for medium to heavy-duty works to reduce the heavy costs associated with hand and finger injuries. These works could include applications such hand tool use, pipe handling and valve operation. Improved glove design has enhanced their use in the oil and gas industry and particularly on drilling rigs in recent years, where ‘struck by’ and ‘caught between objects’ were attributed to 56% of all recordable incidents in 2014. Nowadays major oil and gas companies enforce the use of more rugged new-technology in gloves. Adding thermoplastic rubber ribs to hand gloves to absorb and dissipate impacts on the back of the hand is one of the features of new produced gloves that maybe a solution to the high rate of injuries due to ‘struck by’ and ‘caught between objects’ incidents. Waterproof, high visibility, impact absorption, durability, high dexterity and better grip are the features of new produced gloves. While wearing safety gloves is crucial to hand protection, selection and wearing the correct type of gloves is also critical. Even though gloves provide high levels of protection, workers are unlikely to wear them for extended periods if the gloves are uncomfortable or hinder their ability to do their jobs. Implementing a safety gloves survey would help to assess the working environment and define which type of glove is required for each task. There is also an option to trial the protective gloves. A trial can be a good way to establish employee support and assess the suitability. A range of safely products including finger savers, pipe catchers, pipe handling tools, push sticks and load handling straps were produced by different manufactures to support oil field personnel in hands free policy, and are being used by oil and gas companies to reduce the number of hand and finger injuries. These protective tools are designed to remove workers’ hands and fingers from danger zones. Clear identification of hazardous areas such as pinch points through the use of colour coding and warning stickers is widely used by oil and gas companies to enhance employee awareness and reduce the number of hand and finger injuries. Considering compliance with the regulatory requirements and standards, equipment manufacturers should implement such systems on their equipment before putting their equipment on service. However, frequent use of equipment and other factors such as weather conditions may cause the warning paints and stickers to disappear and repainting may required. Thousands of people are injured every year when rings, bracelets and other jewellery gets caught in machinery or pinch points. Not allowing employees to use rings and jewellery while performing tasks is critical. There is no doubt that wearing jewellery such as rings increases the severity of finger injuries and most companies have developed policies and procedures to ban the wearing of jewellery on work sites. The selection of proper hand tools is crucial for the prevention of hand and finger injuries. Using the wrong tools for the job or using the right tools in the wrong way can result in a serious hand or finger injury. Regular inspections of hand tools and using protective tools such as finger savers in combination with hand tools where practicable play a significant role in the prevention of hand and finger injuries. Banning the usage of some tools such as adjustable wrenches is critical as they have a tendency to slip and increase the likelihood of hand and finger injuries. Many machines have built-in safeguards in order to protect employees’ hands or other body parts. Proper guarding on machinery and regular inspections to ensure are they are not compromised are fundamental to prevent exposure of body parts to potential hazards. Despite the efforts of oil and gas companies, the industry statistics indicate that the number of hand and finger injuries are increasing year on year. The literature review indicates that there is no single solution to reduce the number of hand and finger injuries and a range of mitigation measures should be included in companies’ hand and finger injury prevention strategies. Improved technology in some areas such as oil and gas drilling rigs reduces hand and finger injury risks to a certain level, but it has introduced new risks that need to be mitigated. Involvement of employees in hand and finger injury prevention programmes is crucial to reduce the number of injuries.